Recently I got a donated external hard drive from my brother – he knows I like to take apart old electronics. 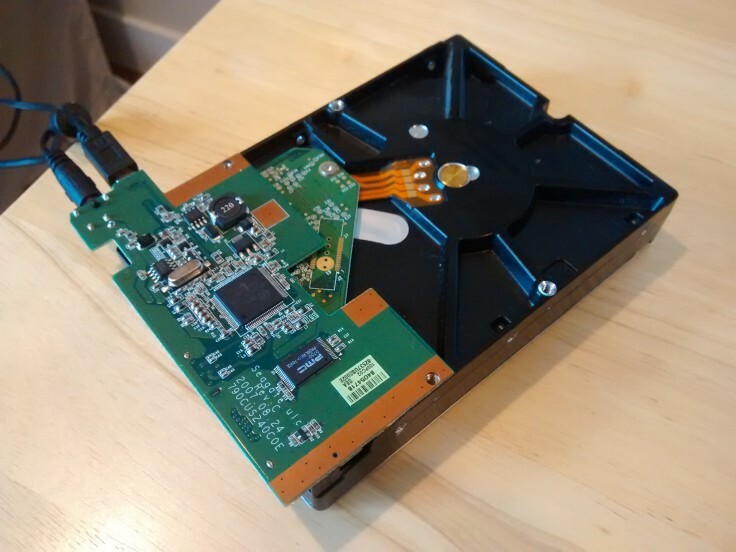 He thought the drive was dead, but as it turned out, only the electronics that interfaced between the hard drive and USB port were disfunctional. The hard drive itself booted up great once I attached it to the old hard drive USB board I featured in an older post. 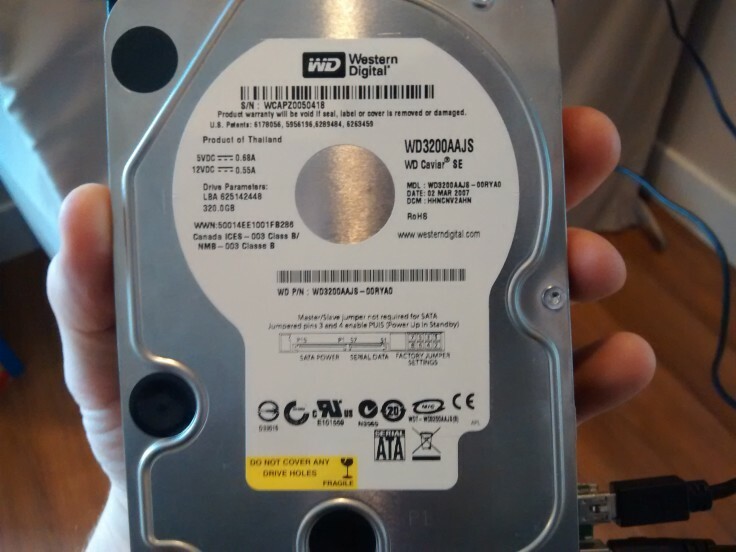 So the hard drive works great now, but I know this hard drive was bought around 2007, so it’s already really old. If I wanted to use it for backup, I wanted to make sure it had plenty of life left. The first and easiest thing to check is the brand name. This one is from Western Digital. They tend to be a middle-of-the-road manufacturer, and I’ve had really good luck with them. (Seagate hard drives on the other hand, seem to ALWAYS fail eventually.) 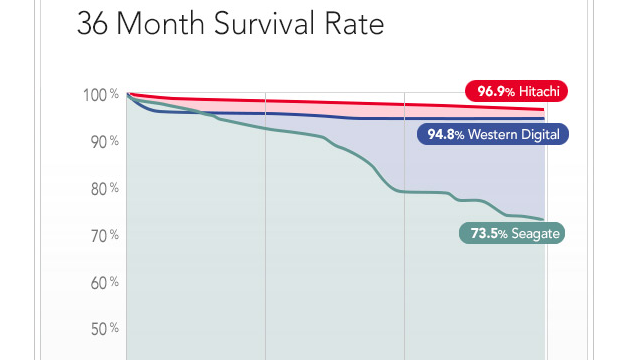 Here’s a great chart from Lifehacker on the various failure rates of different hard drive brands that EXACTLY mirrors my own experience with seagate. The first interesting thing to note is the “odometer” on the drive. This is how many hours the drive has spend spinning. The higher the number, the shorter its remaining lifespan. Anything under 8000 means it has lots of life left (unless it’s a Seagate.) This drive has 21,000 hours on it, so it’s more likely to be on its way out. 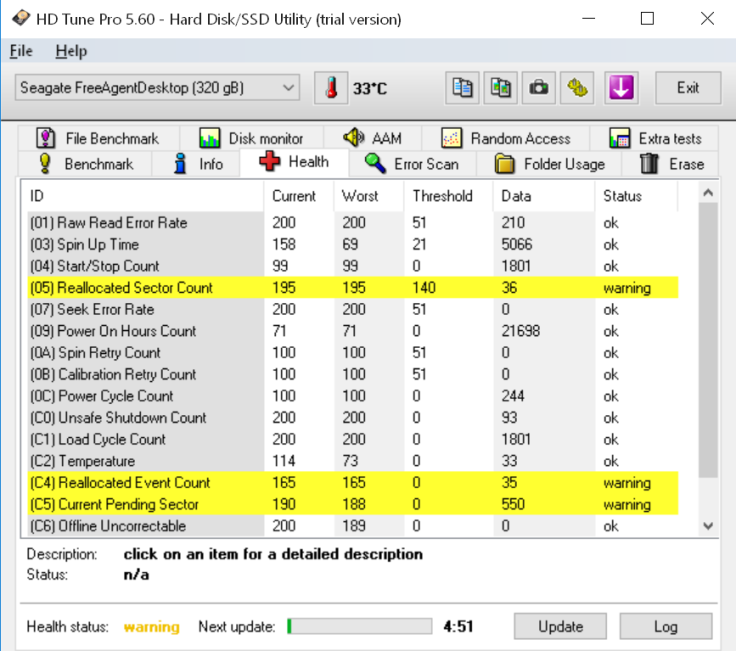 There are two entries in this table that show us the drive is getting ready for a catastrophic failure. Pending Sectors, and to a lesser degree, Reallocated Sectors. Ideally you want these both to be zero. If Reallocated sectors is above zero but never continues to rise, it might be ok. 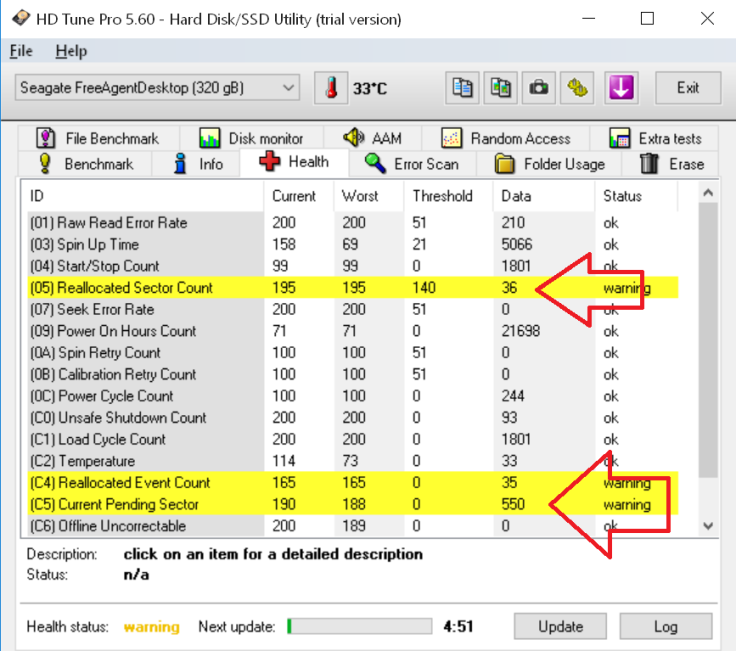 In the case of this drive, we have a very high hours count, and over 500 bad sectors. It’s not looking like a good candidate for keeping backups on. It’s a shame to not use 320gb of a still-functioning hard drive, but it can still be used for installing programs on, just not for keeping any vital data. 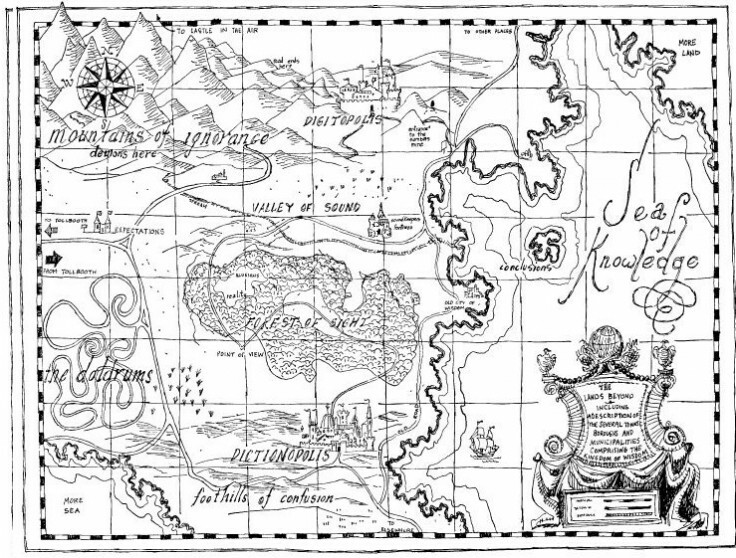 My love for maps began in the very early 90’s with the movie The Phantom Tollbooth. All those amazing places and regions sparked my 6 year old mind and gave me a lifelong love for abstractions of the landscape. My mapping story started up again a few years back when I was put in charge of a compost logistics company. 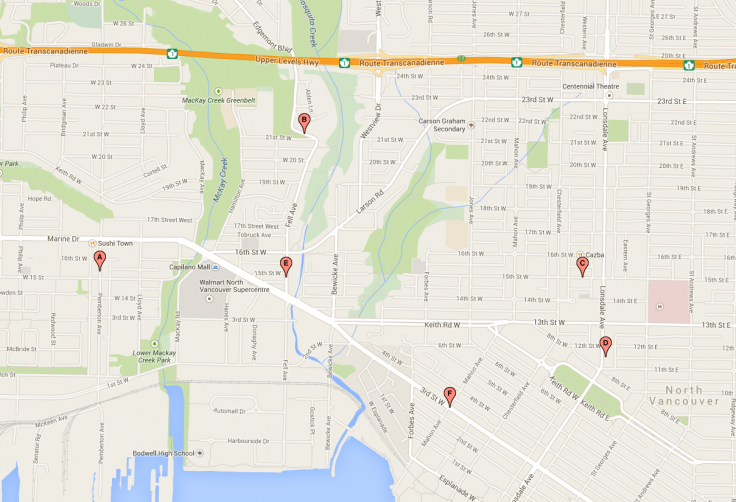 I had to plot 10 ever-changing pickup routes weekly. 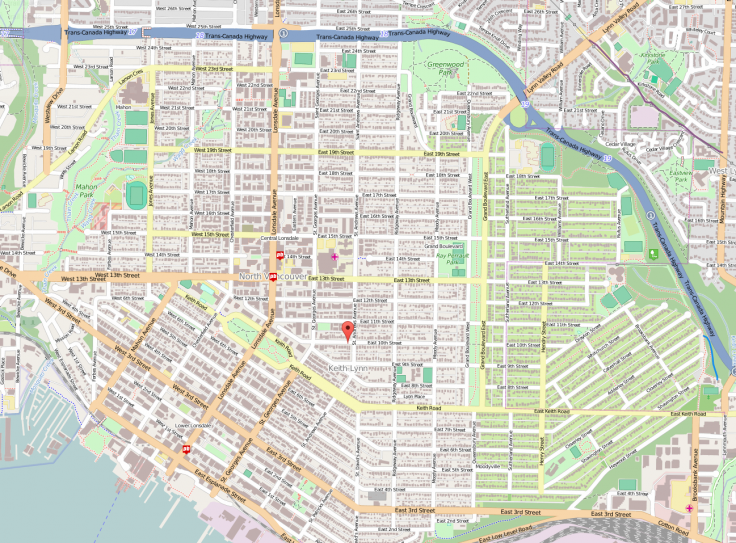 I tried a lot of different free mapping tools online and the best by far for my purposes was BatchGeo. It’s an extraordinarily powerful mapping application that turns an excel spreadsheet into a detailed map. In this example, you can see that each region has its own color. In any given week, only a fraction (about 1/3) of each region actually gets a pickup. So a single day’s map looks like the following example. 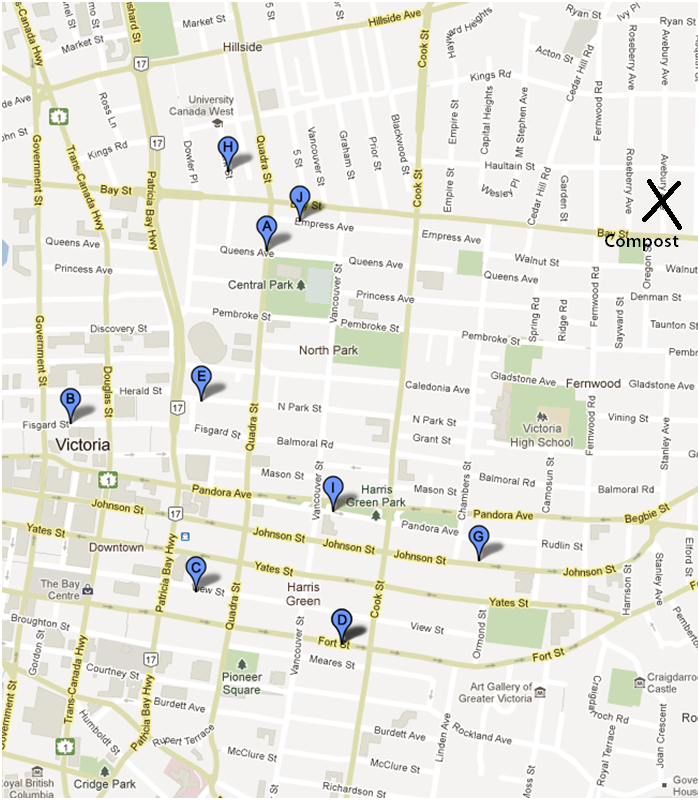 Each week I would manually mark the drop-off location with an X in MSpaint. The only criticism I had of BatchGeo at the time (these maps were made in January 2012) is that the letter system only brought the total possible number of labeled markers in a given category up to 26. You can get around this by splitting a larger route in half, but that would have been very inconvenient for the pickup person. It would have been nice if the indexing system would have switched to numerals after 26. Fortunately for our unique purposes we very rarely needed more than 26 separate plots in any given map category. Update: BatchGeo got in touch with me to inform me that my wish for a higher indexing was granted about a year ago! Now markers in a category can go all the way up to 99. 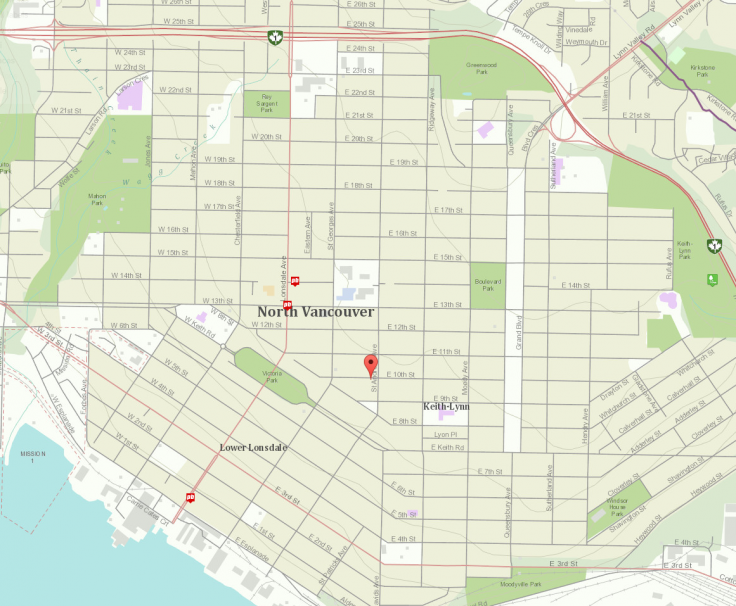 I don’t do as much mapping anymore, but I recently revisited BatchGeo to create this North Shore Thrift Store Tour map of all the thrift stores in North Vancouver. Annoyingly, all the roads are white, the same color as the background. 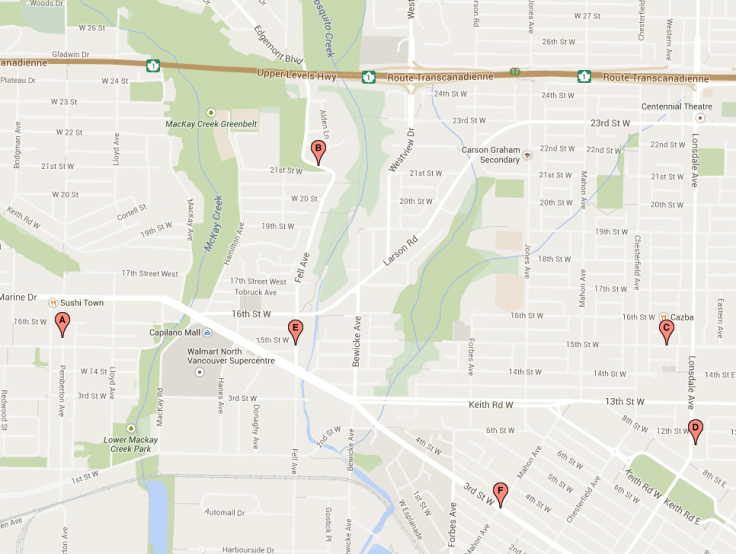 As you can see it’s difficult to tell which road leads where, which is very important in the very chaotic mountainous, suburban road network of North Vancouver. The only way to actually see the roads clearly is to use the “terrain” view, but this has the severe disadvantage of being much more wasteful on printer ink if you wanted to print this out. Which I always do with BatchGeo maps. I’m sure this isn’t BatchGeo’s fault, as they simply use Google Map’s API to create their maps and probably have very little control over the styling. However I imagine they could quite easily add on another of Google Maps’ lesser known layers to make the map more revealing. 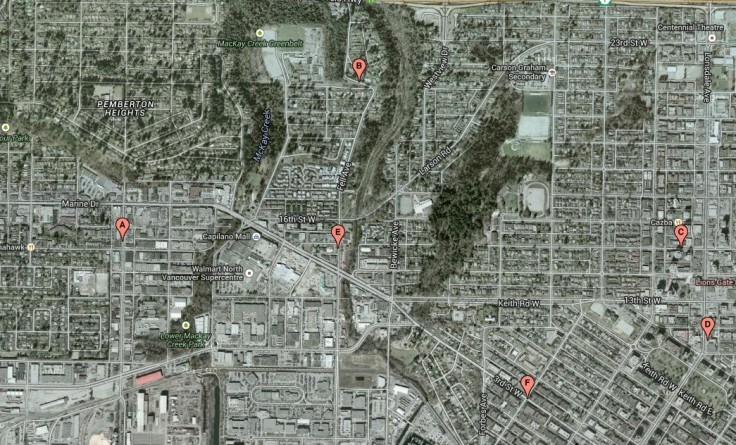 Here is the same area using Google Maps’ ARCgis and OSM layer views, respectively. 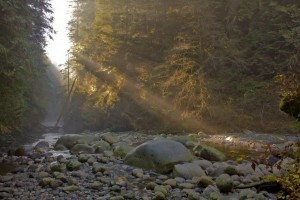 These maps are not default on Google Maps, but you can access them using TrailForks.com, an outstanding mountain biking trail mapping site. Both are incredible views, one even has outlines of every individual building. ARCgis layer, Google Maps via Trailforks.com. OSM layer, Google Maps via Trailforks.com. Despite not meeting just a couple of my power-user wants and needs, for most situations I can comfortably recommend BatchGeo. I’ve never needed to use their paid service, as their free service has always met my needs perfectly. Use BatchGeo for free at www.batchgeo.com. Update: After seeing my review BatchGeo made a small change to their road styling to put some grey outlines on the smaller streets, making roads more visible. Here’s the Thrift Tour map again with the new road styling. Someone I know suffered from RSI for 10 years in both of his arms. The last 5 of those years he was working 80+ hours a week programming and building his startup company. He tried every conceivable specialist, therapy, product and device, spending in total over $30,000 during those dark years. Throughout that period he dealt with constant pain, numbness and tingling, in addition to inflammation in his elbows, wrists, shoulders, and upper back. It would take many pages to list everything he tried, but the following methods are what actually worked for him and moved him towards being 99% pain free and typing happily all day now. He did NOT want to undergo surgery or cortisone injections and in the end he succeeded in avoiding these high risk “solutions” to his problem. My friend took a capsule of each of these these daily on an empty stomach, depending on his level of pain. He still takes them occasionally for when he doesn’t sleep well or has intense work days that cause some RSI pain to return. It’s quite interesting to read the reviews on the Amazon listings above. My friend was not the only one to have excellent results as a result of taking these supplements, many others had similar experiences. Risks of taking supplements are extremely low but be sure to read carefully and understand warning labels. 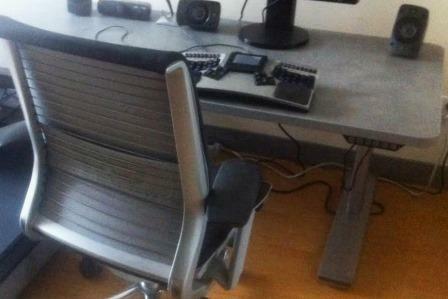 My friend has made the following ergonomic equipment a part of his daily life. 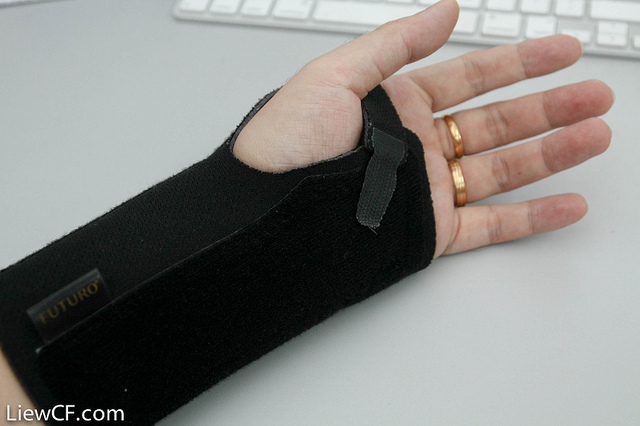 Since he spends so much time at the computer as a programmer, he needs equipment that will put the minimum amount of strain possible on his body. An ergonomic chair. He uses a Steelcase “Think” Chair. Instead of a mouse he prefers a high end touchpad – the Cirque Smart Cat Pro – placed on top of the keyboard. He reports that he’s tried many keyboard/mouse combos and hasn’t found anything close to as good. Ginger tea appears to halt inflammation. You can use a small cube of ginger steeped in hot water, there’s no need to buy ginger tea in tea bags. I like my ginger tea with lemon or the herb lemon balm. Massage therapy helps a bit, but it’s very expensive. If your healthcare covers a few sessions, why not. My friend only takes ~2 massages per year now, he used to have them one or two times per week. Cold / hot arm baths can reduce inflammation. Fill two plastic tubs with hot water and ice water, and submerge your arms for 30 seconds at a time in each tub, finishing with the cold water. Doing gentle stretches held for 30+ seconds each helps. Good, deep sleep was the #1 most surprising and effective “therapy”. He started using ohropax wax earplugs and an eye mask, as well as the “f.lux” software on his PC to get a full 8 hours or more of sleep. 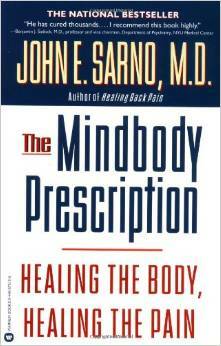 This helps more than any supplement or massage therapy session. My friend read this book to the very end and did all the exercises. Within 10 days he no longer felt pain in his arms and was well enough to cancel his weekly massage therapies. To this day he is feeling fantastic. After good sleep, this was the second most surprising thing about curing RSI. The guy who started google docs fixed his RSI using the same techniques. The above advice was originally sent in a private email conversation between my friend, myself and my brother. It was published here with permission. My friend is still going strong after curing his RSI, he writes about music and art at submetallic.com. Yesterday I tried an E-bike for the first time. It was an absolute pleasure and I’ve been thinking about my ride ever since. An E-bike works by sensing the amount of power you put on the pedals and supplying an extra boost to that power via an electric motor on the rear axle. 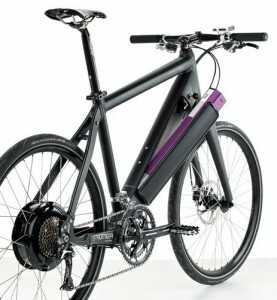 The Stromer E-bike I tried will magnify your own pedal power up to 300%. It’s a complex computerized system that results in a seamlessly intuitive ride for the cyclist. Riding an E-bike is exactly like riding an ordinary bike except that you feel like a superhero when just a bit of pressure is magnified several times to rocket you up the same hills that you would struggle up on an ordinary bike. The E-bike will charge its high-capacity Lithium Ion battery in about 3 hours. On a full charge it will propel you forward 100 kilometers, or 60 miles. 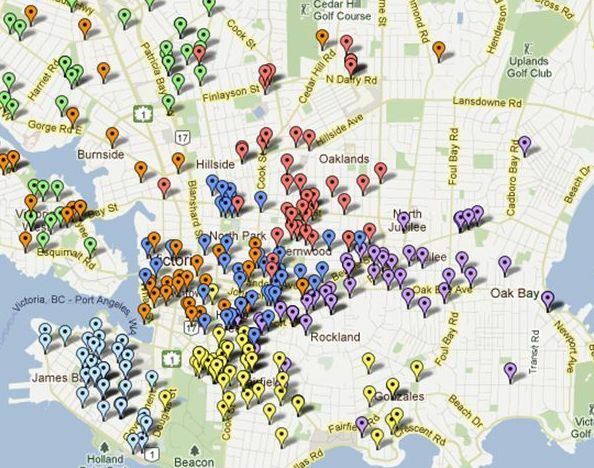 That’s well within most commutes, which is where I see bikes like this winning their largest user base. At 52 pounds, it’s heavy but just light enough to be carried up a small flight of stairs. 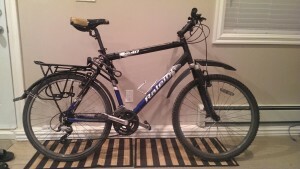 For a standard-bike comparison, my brother’s steel frame mountain bike weighs about the same. The guys demoing the Stromer told me that its design looks “the most like an ordinary bike” of all the other E-bike designs out there. I have to agree that that it looks very much like an ordinary bike, other than the significantly thicker down tube housing the battery and the hefty rear axle where the engine lives. The Stromer’s motor can be set to one of several drive modes. Eco is the mode that provides the minimum assistance, adding just 50% to your pedal power. Early on in my journey I set it to offer the maximum assistance, 300%. I would have gone higher if I could have – the extra power is addicting. I know that if I used Stromer as my main bike, I would quickly lose strength in my legs because the 300% assistance is offers makes biking so wonderfully effortless, especially up hills. After surrendering my government-issued ID as collateral and signing away my rights to sue Stromer if I had an accident, I started on up the hill with my head protected by the biggest helmet they had. The test track began at the Stromer tent at the Harmony Arts Festival in West Vancouver and went “up the hill.” My plan was to take the bike 1 or 2 blocks up but the ride was such an otherworldly experience that I went all the way up the hill and was disappointed when it came to an end. I most noticed the motor’s power when accelerating from a stop sign. One easy pedal rocketed me forward through the intersection with such velocity that my body shifted backwards on my seat. 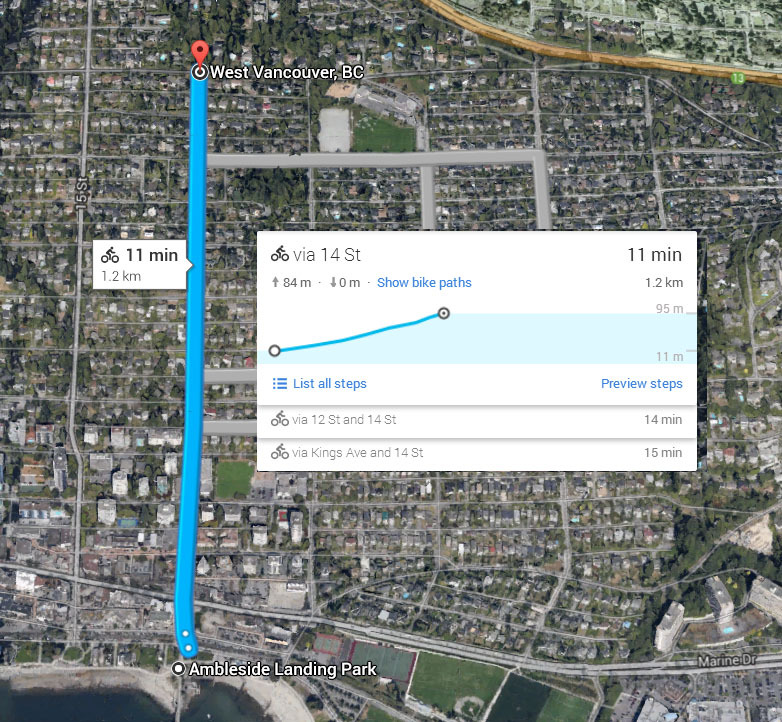 I easily maintained a speed of 28 kph, completing a journey that google says should take a bike 11 minutes in 4 minutes or less. The kids I passed near the top could tell something was off, staring at me as I raced past them going up rather than down. Riding the Stromer was an unforgettable experience even though that experience only lasted 15 minutes. So will I be buying an E-bike? Short answer: no. This bike absolutely shines for commuters and I work from home therefor don’t commute. 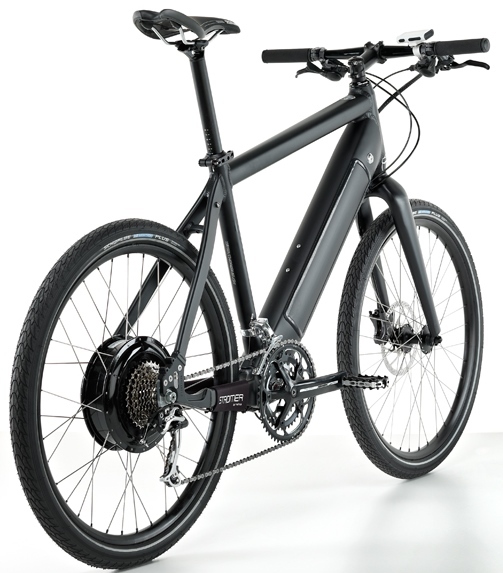 But I live up a mountain, and if I did work downtown, the Stromer E-bike would be an absolute no-brainer. But there’s also the ever-present threat of bike theft which has yet to be taken seriously in Vancouver, one of the worst cities for bike thefts in the world. The bikes I ride now are 5th and 6th bikes I’ve owned in this city; all my previous bicycles had their locks cut and disappeared into the shady underground where hundreds of Vancouver bikes go every year. At 4000$, a stolen Stromer is a serious blow to most people’s finances, and I don’t think you can insure yourself against bike theft. With that said, merely the option of an e-bike has changed my outlook on working downtown. Next time I see a job come up that I think I’d enjoy, I would hesitate less to extend my candidacy for it simply based on the option to commute by Stromer alone.